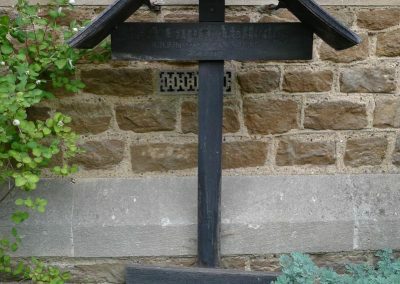 The simple cross is situated outside the church to the East of the main South door. It is formed of a cross with a ‘roof’ for protection. 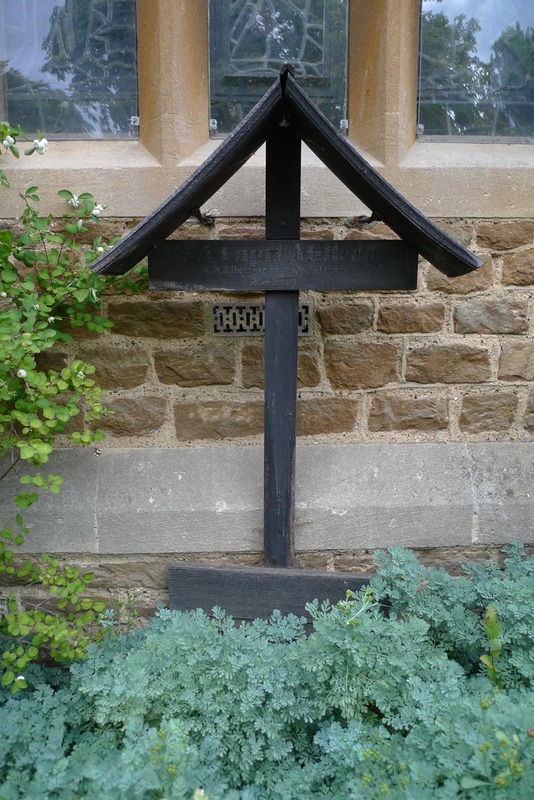 The ‘roof’ is joined to the cross. 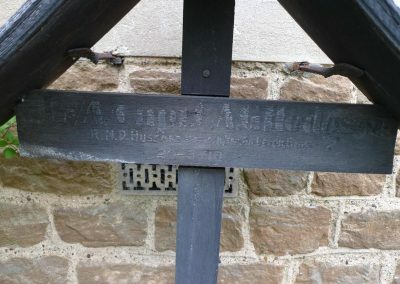 There is text on the main cross beam and a further panel at the foot of the cross with additional information. Text is barely discernible being either painted or embossed, and I had to refer to other sources (CWGC, lower panel and guide in church) to clarify. In particular I couldn’t make out (nor know from the organisation of the RND Hussars, a unit I had not heard of before, what the L/A could mean – if it is in fact L/A! 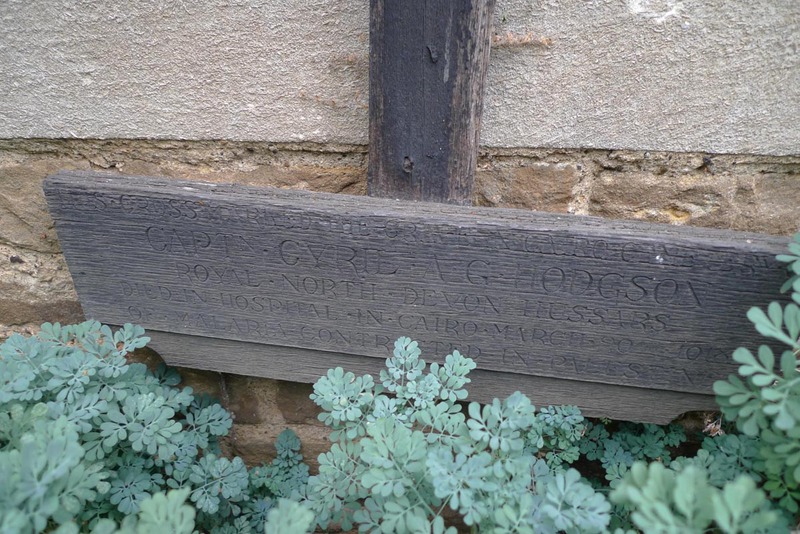 Text type: On cross beam: Possibly just painted. Some evidence that the wording is slightly raised from the surface of the cross bar. Text on lower panel is engraved. Mounting to wall: Two long rusty iron rods support the roof and pierce the mortar of the wall. Loose. Surface insertion depth (into ground if apparent):None. The upright shaft is cut off behind the lower panel. Finish (varnish, paint, oiled, unfinished etc): Main cross, ‘roof’ are stained. Lower panel is unfinished. Condition (cracked, paint peeling, woodwork, damage etc): Very poor and I would say ‘at risk’. My suspicion is that the only original part from the original grave is the cross beam. The upright of the cross is in too good acondition and finish (the corners are quite sharply defined for instance). I suspect this has been replaced. The ‘roof’ is rather poor in construction and I think was put there once the cross was placed outside the church. The lower panel, given the wording, looks like an addition once the cross was placed on the wall. Cyril Arthur Godwin HODGSON. Captain 1/1st Royal North Devon Yeomanry then formed into (Royal 1st Devon and Royal North Devon Yeomanry), The Devonshire Regiment, 229 Brigade, 74th Division. He died on 20 March from malaria. He was 33. 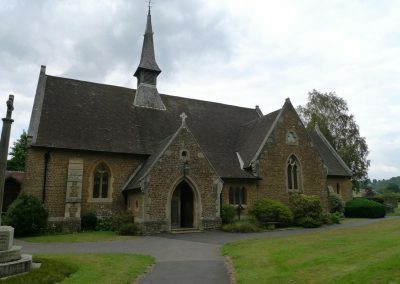 He was the son of Charles D and Emily Hodgson, The Hallams, Shamley Green. He is buried in grave O 135 Cairo War Memorial Cemetery. 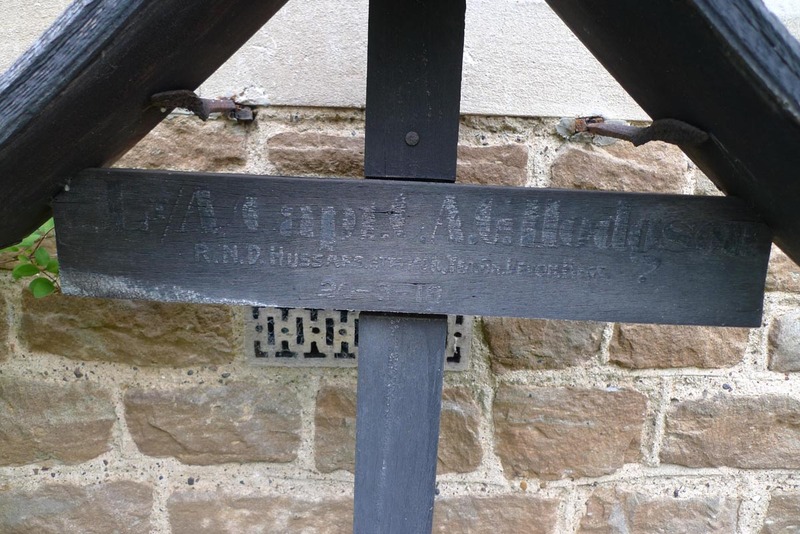 Some further info for you on Cyril Arthur Hodgson at Christ Church. He was one of two sons to Sir Charles and Lady Hodgson, his brother Charles died of wounds received also in Cairo 10 days after his brother. Charles was 3rd Battalion the Queen’s attached to 2/24th London Regiment and was awarded the Croix de Guerre with palm. They are not on the war memorial at Christ Church as the family were in Blackheath neighbouring Shamley Green. The North Devon Hussars were a yeomanry regiment and had served mainly in the Eastern theatre including at Gallipoli, on the 30th April 1918 the division redeployed to The Western Front. 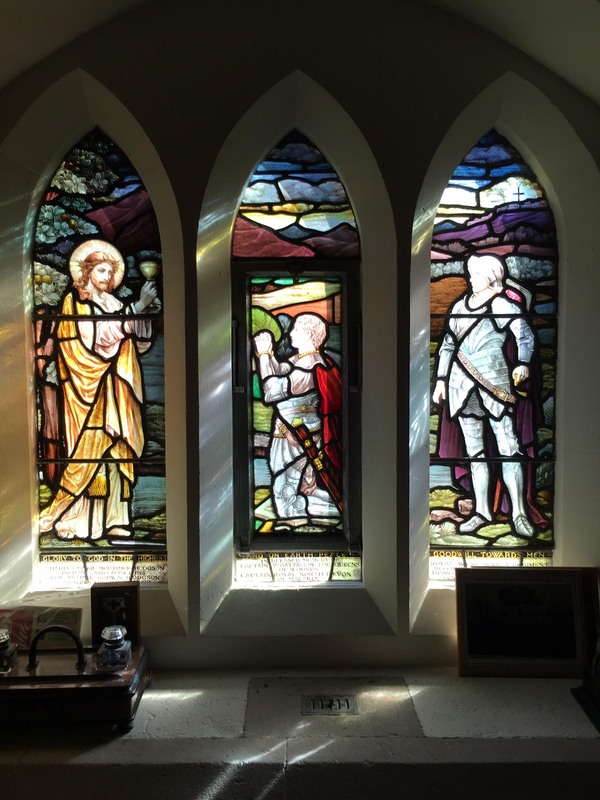 In the church is the attached stained glass window given to the church by the family, it was split into three as some work needed to be done in the church, it is not normally accessible to the public as it is in the choir vestry, but as I left to elderly gentlemen arrived and were very keen that I saw it! 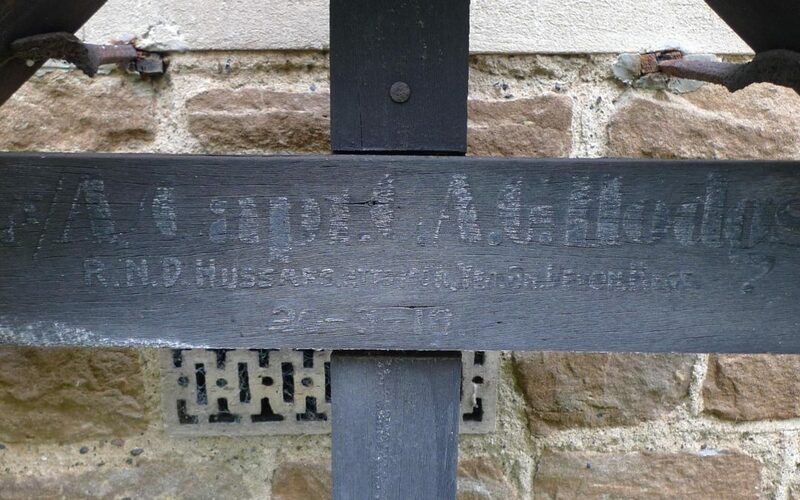 Looking closely at the inscription, I can make out a superscript T next to the L, which would make him a Lieutenant acting as Captain – presumably some sort of field or temporary promotion. Hi Mike, Thanks for the extra detail, nice piece of forensic examination, certainly makes sense. 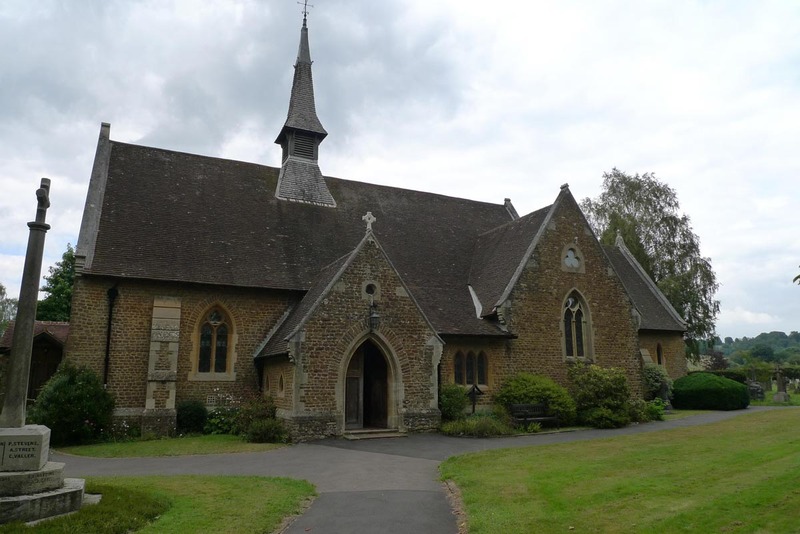 His Father was Charles Durant Hodgson not titled and he was a Captain, He went from the Devon Hussars to the Queens west surrey regiment joining his brother who also died.